Preface: This post is brought to you by my work for the Blogger Prom Committee. Blogger Prom (official blog) takes place on Wednesday, July 22, 2009 in West Hollywood, CA. Free cocktails, delicious food, sweet giveaways, a gorgeous venue and only bloggers in kitschy, cool, weird prom attire. It’s closed to bloggers and invite-only so if you are a blogger and can make it, contact me (esthert at gmail) with your URL via email. “Closed” also entails no more invites once we reach capacity! As they always say: Location, location, location!! 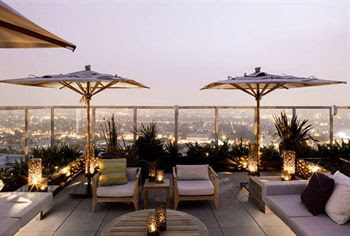 We have finalized the venue of our phat Blogger Prom, and it will be on the rooftop of The Hyatt Andaz Hotel, located right on the Sunset Strip in West Hollywood. That’s right – the rooftop. Caroline and I (Esther) made a visit to the space and were absolutely floored – so to speak! The north view is of the Hollywood Hills and the south, The Sunset Strip in all its glory. Not only that, Andaz will be providing food featuring their very own chef Sebastien Archambault, who hails from France by way of a short stint in Mexico. He procures the menu at the hotel restaurant, RH, with fine detail and is always revising and perfecting. Our blog-happy guests will enjoy a very special Summer Californian menu at Blogger Prom. The Andaz Hotel just finished their serious $35 Million remodel in January of this year so Blogger Prom guests will be some of the first to really experience the “reformed” hotel known as The Riot Hyatt. Yes – this is the famed stop-off where members of Led Zeppelin have rented entire floors and driven motorcycles through the hallways (the movie Almost Famous also recreated these scenes here), Keith Richards of The Rolling Stones dropped a TV off the balcony and Jim Morrison permanently lived for years. Because bloggers are the new rockstars. 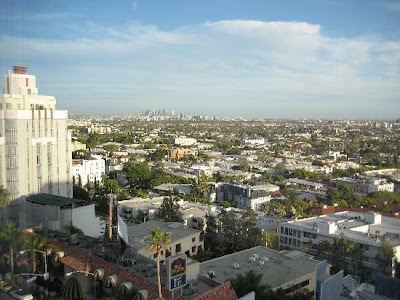 This entry was posted in Beverly Hills, Blogger Prom, Events, Food, Hollywood, L.A., Relationships, West Hollywood and tagged andaz, bloggerprom, hotel, hyatt andaz, riot hyatt, sunset blvd, sunset strip, West Hollywood. Bookmark the permalink.